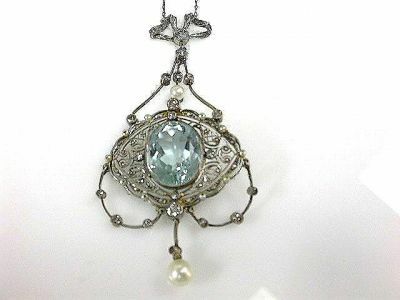 A beautiful Edwardian platinum openwork necklace featuring 1 oval faceted cut light intense blue aquamarine, est. 14.36ct; 10 old European cut diamonds, 0.88ct (SI-I1 clarity: I-J colour); 10 single cut diamonds, est. 0.34ct (SI-I1 clarity: I-J colour), 28 rose cut diamonds, est. 0.10ct (SI-I1 clarity: I-J colour) with 10 white seed pearls, approx. 1.8mm and 2 suspended round white pearls, approx. 4.34-6.06mm. The necklace is approx. 18.5 inches (46.99cm) in length.